The South Downs Way National Park Authority has a well-established group of volunteers who survey the South Downs Way on a regular basis. Early in 2014 exeGesIS completed a base line survey of the South Downs Way which stretches 200 km from Beachy Head to Winchester. 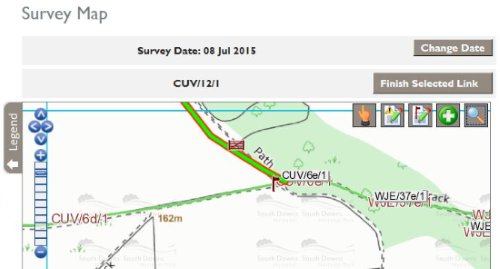 We then provided a website that would enable South Downs Way volunteers to enter condition survey information, previously recorded on paper maps, onto the web. This condition survey information was then be uploaded directly to the exeGesIS Countryside Access Management System (CAMS) software for analysis and reporting. National Park Officers can also assign additional tasks to volunteers through the website. The National Park has subsequently expanded the use of the website to volunteers completing park-wide Best Value Performance Indicator (BVPI) surveys. Further information from Kathryn Steemson.